While the nations of North Africa and the Middle East grapple with a year of existential change, Morocco is proceeding with its tradition of massive music festivals. The granddaddy of them all, Mawazine — held in the Moroccan capital of Rabat — has just concluded. This international festival has provoked controversy, even as it showcases Morocco’s unique place amid the upheavals of the Arab Spring. Over 10 days, some 1,800 artists performed on nine stages, the biggest ones able to accommodate up to 100,000 fans. The top acts are from Africa, the Middle East and the West, and lots are from Morocco. 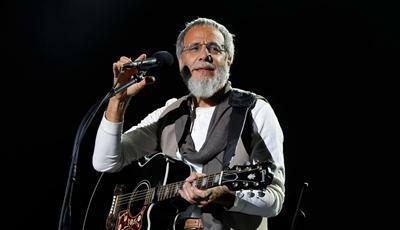 To give you an idea of the festival’s caliber, this year’s Western acts included Kanye West, Joe Cocker, Lionel Richie, Shakira, Earth Wind & Fire and Yusuf Islam, formerly known as Cat Stevens. 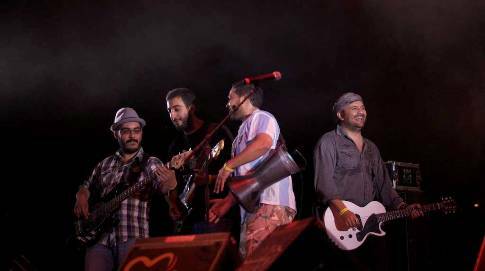 Mawazine began 10 years ago, just as Mohammed VI became king of Morocco while still in his 30s. Some call this “the king’s festival,” because his patronage has done a lot to make its extravagance possible. Mawazine organizers loudly proclaim the king’s oft-stated values: diversity, tolerance, building bridges between cultures. It’s a message he especially wants Morroccan youths to hear. Spokesman Abbas Azouzi, from the nonprofit behind Mawazine, Maroc-Cultures, says Morocco is a young country in terms of population — about 60 percent of the population is under 25. It’s no surprise, then, that the Mawazine lineup also included young Moroccan rappers and rockers, notably one of the most popular rock bands of Casablanca, Hoba Hoba Spirit. Hoba Hoba frontman Reda Al Ali has played Mawazine four times, but he notes that this year, he did so with some ambivalence. “This festival is in the middle of a controversy about the political statements of young Moroccans asking themselves, ‘Is it legitimate to have big stars and to put so much money into these festivals, while we … have no royalties, we don’t have places to rehearse in? Is it legitimate?’ This is a real question,” Al Ali says. Some of Al Ali’s more radical peers called for boycotting Mawazine altogether. They argued that money should be spent on helping the poor, or on making music a viable year-round profession. “If you are really in love,” one critic wrote, “you have to give your lady a flower every week, not just on her birthday. Morroco wasn’t always a friendly place for musicians. Even though Hoba Hoba Spirit drew one of the rowdiest and most enthusiastic crowds of this year’s festival, when the band started out 10 years ago, the country’s music industry wasn’t interested in a Moroccan rock group. Hoba Hoba had to plan concerts in secret and often hide from the police. With no other options available, the group turned to the Internet to reach fans. Middle East historian Mark Levine says that the way bands like Hoba Hoba Spirit built their audience using the Internet became a kind of dress rehearsal for the political upheavals we’re witnessing today in Morocco, Egypt, Tunisia and elsewhere. The do-it-yourself approach certainly turned things around for Hoba Hoba Spirit, but equally important was having the public visibility that Morocco’s festivals provided. It would be wrong to think that Morocco is immune to the forces driving the Arab Spring. During the Mawazine festival, there were street protests in Rabat, with generally a few hundred people demonstrating in front of the parliament building. At least one of these demonstrations was broken up by police with batons. But meanwhile, tens of thousands thronged to the big Mawazine stages each night. Mostly, these were just music fans. But for crowds gathering to hear politically engaged local bands, or singers from marginalized ethnic groups, the festival gave people a chance to vent frustrations and experience powerful solidarity. Morocco’s commitment to public celebrations of culture sets it apart from its repressive neighbors. It’s worth noting that Mawazine has faced as much criticism from religious conservatives as from progressive youths. So, whatever you think of his reforms, King Mohammed VI has demonstrated an impressive awareness of his country’s cultural politics. If his centuries-old monarchy ultimately navigates the storms of the Arab Spring, festivals like Mawazine may well be part of the reason.